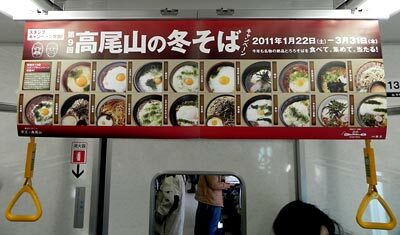 A hanging poster announcing "winter soba campaign"
On Sunday, I went to Mt. Takao. Mt. Takao was granted three stars by "Michelin Green Guide Japon" when it was issued for the first time in 2009. This news surprised the Japanese people, because few of them expected for Mt. Takao the same high rating as for Mt. Fuji. Takao was traditionally a popular destination for weekend trekkers and their number skyrocketed since it was taken up by Michelin Guide. 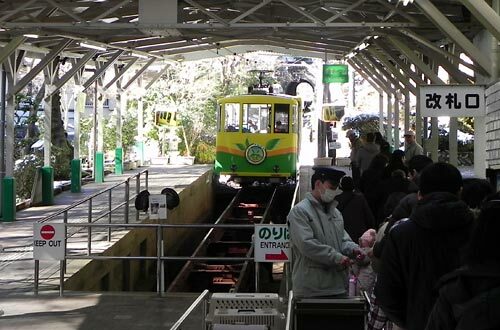 The most convenient way for Tokyo residents to go to Mt. Takao is to use Keio Line. It takes only 47 minutes from Shinjuku, the venue of City Hall of Tokyo, and costs 370 yen. No metropolis in the world has such an easy access to the mountain with rich nature as Takao, I believe. This time, hanging posters in the Keio Line coaches captured my attention. Nineteen soba-restaurants in Takao jointly organize a winter soba campaign; "eat yam-soba, collect stamps and win prizes!" I could not resist to the temptation to the yummy yam-soba. The end station of the cable car "Takao-san" is already as near as 15 minutes' walk to Yakuo-in, the religious center in Takao. From the terrace in front of "Takao-san" station, we can see the Hachioji juncture of Chuo Expressway, which connects Tokyo with Nagoya through Yamanashi and Nagano prefectures. I bought a small "tengu-yaki", a sort of Japanese muffin filled with bean jam. Its tengu (1) face shaped skin was soft and crispy and the filling was delicious due to special kinds of bean. "Tengu" is a superstitious creature: a goblin and angel at the same time. It has a couple of wings and super-natural power. 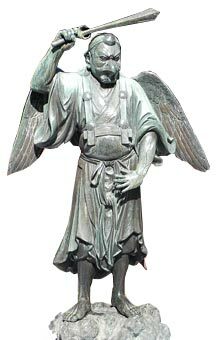 Tengu is closely related to "Shugendo" and usually depicted in the shape of Shugendo priest. There are two types of tengu, the one with long nose and the other with crow-like beak. From the hiking route leading to Yakuo-in and the summit of Mt. Takao, we can see Tokyo and the Kanto Plain on the left side and the deep forest on the right side. 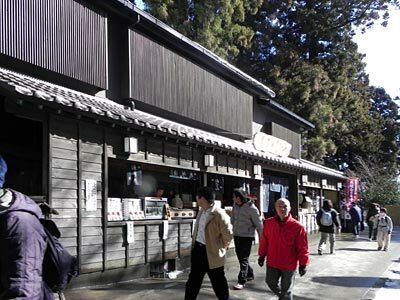 Takao is famous for its rich flora, but it was still February and the snow covered everything on the earth. 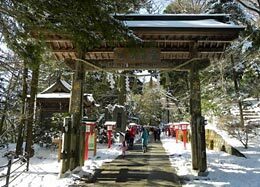 Thick Japanese cedars grow in this area and very old ones are decorated with "shimenawa" to indicate their sacredness. Yakuo-in is an old temple, which was established in 744 by Gyoki. The principal Buddha of Yakuo-in was and is Bhaisajyaguru (Buddha of healing and medicine), however, Izuna-gongen was added as a new principal deity in the 1370s and Yakuo-in gained its popularity and influence. 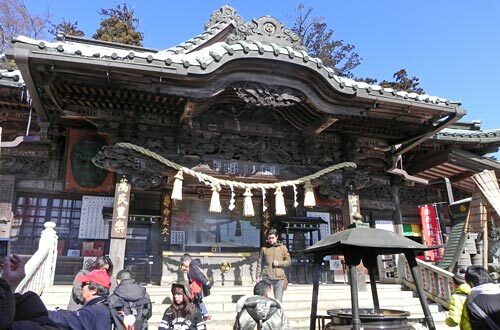 Izuna-gongen is originally the god of Mt. Izuna in Nagano prefecture. However, mountain worship, which had traditionally prevailed in Japan as a form of Shintoism, merged with Buddhism in the same way as other lines of Shintoism to justify them with the elaborated Buddhist theology. The god of Mt. 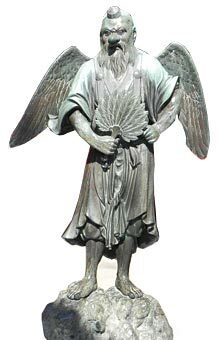 Izuna was then identified with several Buddhist deities and worshipped as a god for military victory. Izuna-gongen is usually expressed in the figure of tengu with crow-like beak. 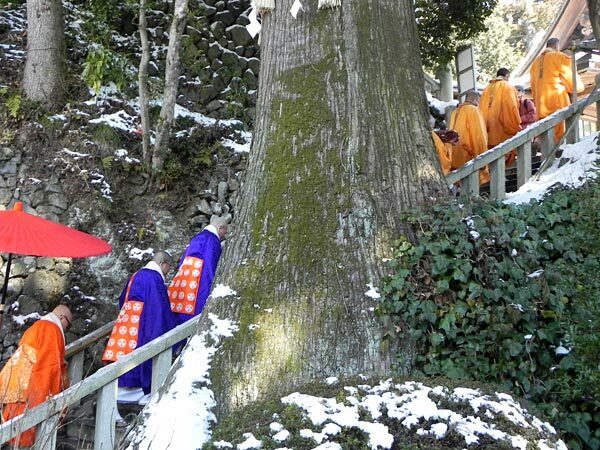 Shugendo is a mixture of local mountain worship and Buddhism and in particular it is closely related to the esoteric Buddhism and equipped with mysterious tools and rituals. The followers of Shugendo try to come to the religious enlightenment through tough training in high mountains where they feel nearer to the deity. They wear special uniform and train in groups away from human dwellings (2). Therefore, it is natural that people associated them to Tengu. Hondo where bnoth Bhaisajyaguru and Izuna-gongen are worshipped. "Taniko", a noh play, describes confrontation between the groups discipline of Shugendo monks and the personal situation when they are in high mountains. "Taniko" was adapted by Berthold Brecht to his "Jasager" Jasager is a pedagogic opera which handles the confrontation between the discipline of group and the freedom of individuals in the context of communist movements. Music was composed by Kurt Weill, but very different from "Three Penny Opera." 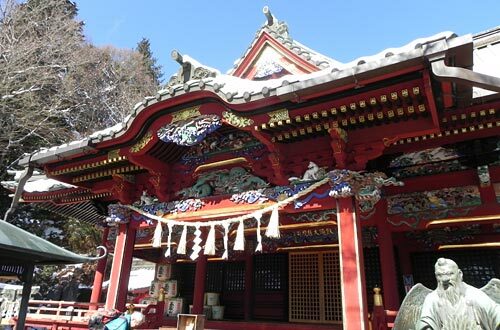 It is interesting to find that Izuna-gongen is mainly worshipped in a Shinto shrine (with tori) though it is also worshipped in the main Buddhist temple next to it together with Bhaisajyaguru. 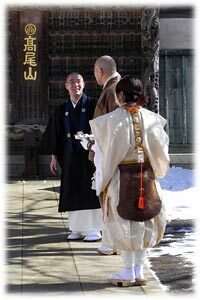 I happened to find a Buddhist monk talking with two monks in Shugendo style. It is rather difficult for us who live in the modern time to understand the mixture of two religions, because Shinto and Buddhism were severely separated by the Meiji Government in the late 19th with the view to restoring the authority of divine Emperor. Therefore, it is very natural for us to see temples and shrines as different institutions. But, they used to form inseparable religious entities till the beginning of the Meiji period (1868-1912). While walking around the Yakuo-in's court, I was surprised by the powerful sound of trumpet shells. That was the sign of beginning rituals. We gave up climbing further up the mountain as the road was very slippery. We entered instead a soba restaurant in front of Yakuo-in and ordered yam-soba. It was really delicious despite of my rather low expectation. 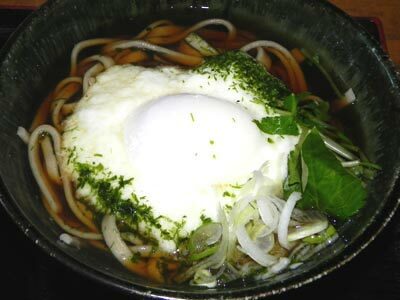 Thick soba noodle fit very much to the grated yam and hot soy-based sauce and the creamy soft-boiled egg added rich taste to the noodle bowl. We had a good choice of restaurant. A half-day excursion with religion, nature and culinary satisfaction ended early in the afternoon.